Jean Stockdale... : "Mirror, Mirror"
It's Tuesday. Seriously? How did that happen? Several years ago I wrote a Bible study especially for MOMMAS on the Book of James called "Mirror, Mirror on the Wall." This is an excerpt from that study. I gave my heart to Jesus Christ a short time before I found out I was pregnant with our first son, Jason. The prospect of having a child to raise for the Lord Jesus drove me to my knees and into the Word of God. Studying the Scriptures was new to me, but I was certain that it was a necessity if I intended to train up this child in the way he should go. How could I possibly train a child in the truth if I did not know it? I certainly did not know much about the abundant Christian life, but I knew enough to know that I wanted it, whatever it was. I could also tell that a change of heart required a changed life. I knew I had experienced a change of heart. There was no doubt about it; I was a new creation in Christ. My conversion was genuine. I had been washed by the blood of the Lamb. My sins were washed away, and I was whiter than snow. That much I was sure of, but I did not quite know how to tackle the changed life. The overwhelming desire to be a godly wife and mom compelled me to become a student of the Word of God. I was desperate for God. I was desperate to hear from Him and to learn to walk in His ways. Apart from Him, I knew I was doomed for failure. God’s plan for the family is a generational faith. By that I mean it is His intention that the faith be handed down from one generation to the next. While every child is born with a free will and must ultimately choose to receive or reject Christ, there is much that a wise and godly momma can do to influence her child’s decision. God’s plan for the family is a generational faith. Since this is the case, it is crucial that we live out our faith on a daily basis. I am not talking about something that blooms on Sunday morning and fades before lunch. I am not talking about playing church or faking faith. I am not talking about being a casual or carnal Christian. If that is what you have in mind, you will never successfully hand down the faith to the next generation. Who would want what you have? What I am talking about is a woman who fears God and is committed to walking in His ways. I am talking about a woman who is so in love with Jesus that His presence in her life radiates out of her. I am talking about a woman who wears the fragrance of Christ on her life like a shawl, covering her and clothing her in His righteousness. If you are determined to be that woman, then come alongside me and let’s walk together! That is my heart’s desire as well, and we can learn together. When I think of great mothers, I am reminded of the unwavering faith of the mom of Moses. Moses’ mother is barely mentioned by name in the Scriptures. Exodus 6:20 says, And Amram married his father’s sister Jochebed, and she bore him Aaron and Moses; and the length of Amram’s life was one hundred and thirty-seven years. The mother of Moses was certainly not well known, but she managed three great and godly children. Jochebed raised Miriam, a prophetess, Aaron, a priest, and Moses, the chosen leader of the Jewish nation. Impressive, wouldn’t you say? Yet few people can remember her name. That tells me that my greatest legacy to my children is not in the public arena of teaching or writing, but in the private one that few people have had access to outside of my immediate family. My truest self was revealed to my husband and boys as we all lived together in this lively household, day in and day out. Who I really am is not nearly as truly conveyed on the platform as it was in the playroom, in the kitchen, in the carpool, in the grocery, and in the million and one places that mothering has taken me. My truest nature was best revealed in the mundane monotony of everyday family living. The world at large may never know or remember my name, but two little boys watched me live out my faith, drenched in my humanity with its flaws and frailties, for twenty years (give or take a few). That is real Christianity. That is who I really am. When you look in the mirror, who do you see? 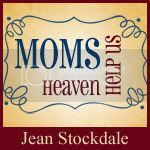 I am hosting an on-line Bible study for MOMS on the book of Ephesians called "High Stepping in Heavenly Places." Click here to check it out. Podcasts of "High Stepping in Heavenly Places"are available free of charge by clicking here. Every Monday (typically on Monday!) I post Monday Morning Manna for Moms to encourage and inspire MOMMAS in the fine art of Christian mothering. Check in often for huge doses of endorsement of this holy occupation! Blessings. HUNTER STREET BAPTIST CHURCH-BIRMINGHAM, AL. Mirror, Mirror on the Wall. Daily we look into the mirror to see if we have bed head, lipstick on our teeth, mascara on our cheek, or all of the above. A glance at our reflection gives us a general idea of the way we are presenting ourselves to the world. As believers we want to develop the spiritual discipline of looking intently into another type of mirror–the Word of God. Out beauty will fade, but when we invest in developing the beauty of holiness the aroma of Christ will beautify our lives. Join us for Girl’s Night Outon September 15, 2009 with gifted speaker Jean Stockdale. She will encourage us to find everlasting beauty that will not fade! Tickets are $15 (includes dinner) and will be available Sunday, August 2. For more information click here and go to Hunter Street Baptist Church, 2600 John Hawkins Pkwy in Hoover, Al. 35244 (near Birmingham). The number is 205.985.7295.If you live in the area, please join us for a night of Biblical encouragement laced with a healthy dose of sanctified humor! 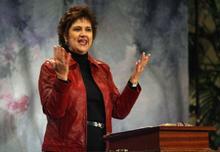 Jean is an international Bible teacher, speaker and author of 7 Bible studies. Jean is personable, practical, and pertinent. For more information about her ministry click here. Her message will challenge your faith, encourage your walk with the Lord, and tickle your funny bone. Don't miss this sweet evening of fellowship. The scourge of the Christian community is a casual attitude toward God and His Word. We can become complacent, gospel-saturated and satisfied. This leads to spiritual dullness. We slow to hear the gentle promptings of the Holy Spirit and reluctant to obey. In the Book of James, the writer exhorts us to a belief that behaves. Don't be merely a hearer of the Word-someone who shows up at church to hear a sermon with no intention of incorporating the TRUTH of the message into practical application. Be a doer of the Word. That is one who lives according to the external control of the Word of God and the internal control of the Spirit of God. James 1:23-25 says, For if anyone is a hearer of the word and not a doer, he is like a man who looks at his natural face in a mirror; for once he has looked at himself and gone away, he has immediately forgotten what kind of person he was. But one who looks intently at the perfect law, the law of liberty, and abides by it, not having become a forgetful hearer but an effectual doer, this man will be blessed in what he does. Precious Christian, the time is now. We must become doers of the Word. We must insist upon a belief that behaves! Blessings. Heaven Help Us! We're MOMS! The sweet friends from the SITS blog are hosting a carnival of giveaways for Spring Fling. This is my contribution. Are you frustrated, aggravated, irritated, agitated, and just plain twitterpated? Congratulations! You're a MOM. Now what? For the last 20 years God has given me a passion to write Bible studies and teach MOMS with the Word of God and encourage MOMS with the Spirit of God. My accompanying 10-set of CDs will give you insight from God's Word. Laced with sanctified humor, practical applications, and personal illustrations from raising 2 sons and releasing them into the world to build their own households of faith, I will help you navigate the mine field of mothering through the study of the Book of James, "Mirror, Mirror on the Wall." God's Word is the foundation for all we should do as a woman, a wife, and a MOM. However, most MOMS stumble at the point of taking profound truths and making the practical for daily living. Join me for an in-depth look into the Word of God for precepts and principles for parenting toddlers to teens. No matter where you are in the process, newborn, school-age, teens, or releasing adult children, you will benefit from this study. We're MOMS! Heaven Help Us. Please begin by leaving a comment. Leave separate comments for each additional entry. Enter as many time as you like. Contest ends at 2 a.m. (Central) on SATURDAY, March 14th. PLEASE NOTICE THE DATE FOR DEADLINE HAD BEEN EXTENDED. The winner will be announced on this blog and notified via email by March 17th and mailing address will be confirmed at that time. Sorry, this giveaway is limited to USA residents only. Any questions, email me at jean@standingnearthecross.com. For more great giveaways click here to go to SITS. Thanks for stopping by. Blessings.